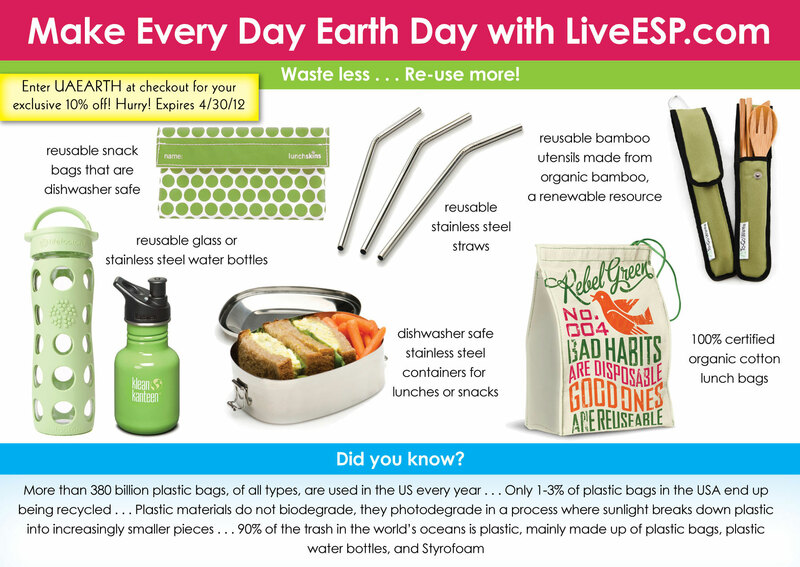 UA Exclusive Earth Day Savings from LiveESP.com! This Sunday, April 22nd, is Earth Day with this year’s theme being “Mobilize the Earth”. The theme’s intent is to bring power to the people, as there has been public backlash at the shortcomings from governments taking steps toward protecting and preserving our environment. “Mobilize the Earth” encourages people to use what they have to demand action, their voice! So we’ll take our own advice and use our voice to tell all of our UA fans about one of our favorite companies, Essential Safe Products (LiveESP.com). ESP is a website committed to healthy lifestyles and a healthy environment. On their site you can find tips and tricks on how to avoid exposure to toxins in food and drink and purchase kitchen and on-the-go products that are non-toxic and food safe. Our favorite items around the halls of UA are the reusable glass water bottles and stainless steel straws. They make Earth Day a YEAR ROUND mission (and were featured at this year’s Grammy’s and in the Oscar’s gift bags so we think they’re pretty cool for that too!). They’re generously giving our UA Facebook fans and blog followers 10% off of their entire order from now until 4/30/12; just enter UAEARTH at checkout for your exclusive savings. Reusable snack bags ~ Because only about 1-3% of plastic bags end up getting recycled and since plastic is not biodegradable, using a reusable snack bag is a great eco-friendly alternative to help reduce the amount of waste you produce. Take a look at the type of reusable bag you use and check to make sure it is free from harmful chemicals like phthalates. Reusable straws ~ Many people like to use straws to help keep their teeth clean but with plastic straws being thrown away, we end up getting the environment “dirty” at the expense of “clean” teeth. Instead of using a new straw every time you sip on a colored drink, try using reusable straws made from glass or stainless steel. Reusable bamboo utensils ~ Plastic utensils are everywhere: when you order food to-go, at the office, and in schools. They often end up in the trash, so to help avoid this, use reusable utensils made from certified organic bamboo, a sustainable resource that does not jeopardize the environment when it’s grown. Reusable food containers ~ Ever thought about bringing your own container for leftovers when you go out to eat? Instead of packing leftovers in containers provided by restaurants, try packing them in a glass or stainless steel food container—an eco-friendly and safe way to store your food. Reusable water bottles ~ Buying a new plastic water bottle every day is neither cost effective nor good for the environment, since bottles are often tossed into trash bins. Switch to reusable water bottles made from BPA free glass or stainless steel as a safe, eco-friendly and non-toxic way to enjoy water and stay hydrated. 100% certified organic lunch bags ~ Replace brown paper bags and plastic bags with a reusable lunch bag made from 100% certified organic cotton. Methods used to grow organic cotton do not use toxic pesticides or fertilizers and have a lower environmental impact than conventional growing methods. ← Win-It-Wednesday ~Featuring Grey’s Anatomy™ By Barco! WE NEED TO GET EVERYONE ON BOARD TO RECYCLING. i AM GLAD TO SEE MORE BUSINESSES ARE BEING MORE ECO FRIENDLY. WAY TO GO UA.